How many zoom levels does the Leica DISTO™ D810 touch have? The integrated digital Pointfinder in the device has an overview camera and additional 1x, 2x and 4x zoom levels. The user is able to the current level selected in the in the middle of the status bar of the screen. To change from one zoom level to the next press the “up/down” arrow keys or use the two finger “pinch/stretch” motion as commonly used on most touch screens. Can I take photos with the Leica DIST0™ D810 touch? What is the resolution? Yes, the Leica Disto D810 touch will capture both photos as well as screenshots. The resolution for photos is 800 x 600 pixels, screenshots have a resolution of 240 x 400 pixels. Both photos and screenshots are saved in .jpg format and can be downloaded via usb cable (see below). Images are not able to transferred via Bluetooth due to Bluetooth 4.0 Smart data limitations. How can I download my photos from the Leica DIST0™ D810 touch to a computer? Photos and screenshots can be downloaded to a computer via USB interface. Connect the included usb cable to the port on the left side of the Disto D810 and a computer. The DISTO™ will connect automatically as a Plug and Play device. Data on the Disto will be available via the use of a file manager such as Windows Explorer. Note: There is no data transfer capability FROM the computer TO the Disto. Additionally, deleting files must be done in the DISTO™ Gallery function, this function is not supported from the computer. Can the brightness of the digital Pointfinder be adjusted for changing lighting conditions? Yes. Upon selecting the digital Poinfinder function the left and right arrow keys on the keypad will decrease/increase the brightness of the display. Why is the laser dot not centered in the crosshair at short distances? How accurate is the tilt sensor in the Leica DISTO™ D810 touch? At room temperature (20°C - 30°C) the accuracy of the tilt sensor in the device is ±0.1° to the housing of the device. To the laser beam the maximum deviation can be up to -0.1° and +0.2°. At any other temperatures the maximum deviation increases by ±0.1°. What units of tilts are integrated into the Leica DISTO™ D810 touch? The Leica DISTO™ D810 touch has 4 settings for angular inclination. Select “Units inclination” and choose between ° , %, in/ft and mm/m. -> The level function in the right hand top corner of the display can be switched on/off using the “level” setting. It is always set to 0.0° and can not be changed into a different unit for tilts. What is the angular range of the tilt sensor in the Leica DISTO™ D810 touch? The integrated tilt sensor in the Leica DISTO™ D810 touch measures the angular deviation from horizontal along the longitudinal axis of the Disto. The angular range is a full 360° at a transverse (side to side) tilt of < ±10°. If the device is held at > ±10° transversely, the info code “i156” appears in the display. Level the unit transversely (side to side) to clear the error. How do you calibrate the tilt sensor of a Leica DISTO™ D810 touch? Choose the icon for calibration. When you select calibration you will be guided through the process. 1) Place the unit on a flat surface with the display facing up. The side opposite of the display should be in contact with surface. Take the first measurement by pressing the “ON/DIST” key on a level surface. The Disto confirms the measurement. Turn the Disto horizontally by 180° and place it again on absolutely flat surface with the display facing up. Complete the second measurement by pressing the “ON/DIST” key on a level surface. The Disto confirms the measurement. Place the unit on end, laser aiming up, on an absolutely flat surface. Take the third measurement by pressing the “ON/DIST” key on a level surface. The Disto confirms the measurement. Keeping the laser up on the flat surface, rotate the Disto horizontally by 180° while keeping it in the same location on the flat surface. Take the fourth measurement by pressing the “ON/DIST” key on a level surface. The Disto confirms the measurement. After 2 Sec. the Distoreturns to the basic mode. The calibration procedure is complete. How do I access the “additional detailed information” about the measurements taken? On certain measurements, there is additional detailed information available in the Leica DISTO™ D810 touch. If such additional detail information is available, two small arrows will be shown in the center of the status bar in the display. Press the UP/DOWN arrow keys to view the available measurements. 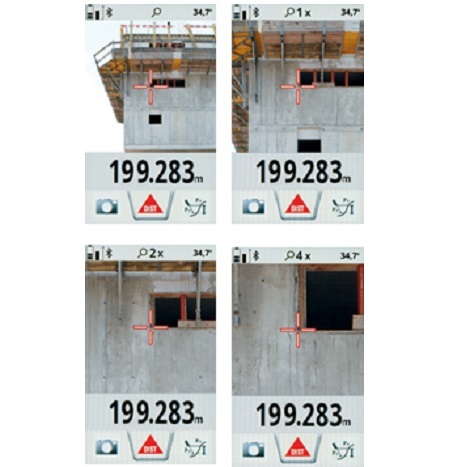 The Leica DISTO™ D810 touch is the first laser distance meter to measure with a picture. What is the accuracy of such measurements? The accuracy highly depends on how the function is used. Best results can be achieved when the measuring object is displayed maximum size on the DISTO™. The reference distance measurement should be taken perpendicular to the distance measured. In this case the accuracy should be better than +/- 1% of the measured object. This applies for width, area and diameter measurements. What accessories are recommended for the Leica DISTO™ D810 touch? For long distances, triangulated or calculated measurements, we recommend using a tripod, even when measuring indoors. A tripod provides for a stable measuring platform and therefore allows accurate targeting, especially over long distances. We particularly recommend the Leica TRI100 tripod. Please note: When using the tripod with its standard tripod head change the measuring reference on the Leica DISTO™ to the tripod thread (in the setting). For long distances we recommend using a tripod, even indoors. A tripod provides additional steadiness and therefore allows accurate targeting, especially over long distances. We particularly recommend the Leica TRI70tripod in combination with the FTA 360 and TA360 adapter. For the ultimate in laser distance meter accuracy Distagage recommends the tripod adapter FTA 360. With fine adjustment for convenient and accurate aiming. This adapter is designed to be used as a tripod head (TRI 100 and TRI70) or can simply be placed on a flat ground. The design of the FTA360 adapter allows the Leica DISTO™ to be attached so that the tripod tilt and rotating axis and the instrument laser axis meet exactly in one point. This allows the user to take measurements when turning the unit horizontally as well as vertically. The adapter can be used with the Leica DISTO™ D510 (an offset of -0,065m (-2 9/16 in) needs to be entered in the D510 device) and the Leica DISTO™ D810 touch. (you can select the adapter in the Reference options of the D810 touch). For measurement especially outdoors and in very bright conditions it is very helpful to use a target plate. We offer different versions in our accessory range. 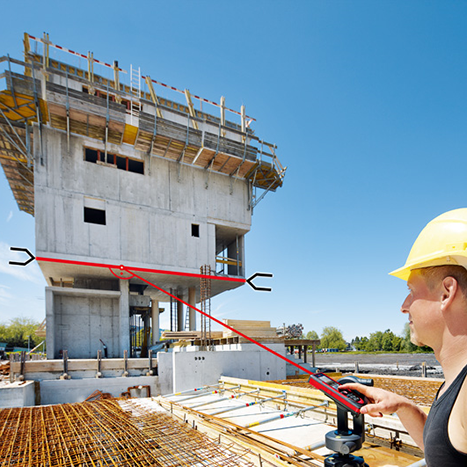 Can the Leica DISTO™ D810 touch also be used to measure horizontal angles? No, the integrated tilt sensor only measures vertical angles. If the device is held at a transverse tilt angle greater than ±10° the display shows an info code “i156”, which means that the device is required to be held level (transversely). What is the measuring accuracy when using the direct horizontal measuring function? For example, if a distance of 10m is measured at an angle of 10°, the error on uncertainty on measurement on the direct horizontal distance (fd) is 3mm. -> in order to have best results with the direct horizontal distance measurements, considering the deviation of the tilt sensor, use the Leica DISTO™ D810 touch as flat as possible. Further information and a table of measuring accuracies you can find online in the FAQ under “Measuring Accuracy”. Can the historical storage memory of 30 values in the device be erased? Yes, the memory in the device can be erased by pressing the delete button when in the memory. All memory values will be deleted. Yes, in the “Settings” you can go to the “Offset Icon” and enter a value that will constantly be added / subtracted from your measured distance value. If an offset value is entered you will see the adequate symbol - a triangle with plus or respectively minus next to the laser symbol. -> If you want to set the offset value back to zero, enter the setting “Offset” and reset it. What is the Long Range (LR) Mode? For long distances under unfavorable conditions (e.g. long distances and very bright sunlight) we recommend to use the special integrated Long Range (LR) Mode . To select the mode please enter the menu and select the “LR Mode”. If the “LR Mode” is turned on in the menu you will see the letter “LR” right next to the laser symbol. This mode will allow you to make measurements that were not possible before because most of the time you would receive the info code “i255” (too less signal). When using this special Long Range (LR) Mode the measuring time increases (it may take up to 7sec). For stability it is recommended to use a tripod when having the Long Range (LR) Mode turned on. How do I know if the device is still measuring in the digital Pointfinder mode? When using the digital Pointfinder in any function, especially in the Long Range (LR) Mode, you will see a clock icon on the top of the display. The clock stays in the display until the measurement is finished. Please do not move the device before! How can I get one extra year of warranty for the Leica DISTO™ D810 touch? Our standard warranty of 2 years can be extended by one additional year if you register your device on our website www.disto.com within eight weeks of the purchase date. If the product is not registered, a two year warranty applies. What does it mean when I attempt a measurement but the unit shows a number on the display versus my measured value? Make sure, the device is placed on an absolutely horizontal and flat surface. Repeat the calibration procedure. If the mistake still occurs, contact your dealer. Change target surface (e.g. white paper). How can I activate the keypad lock? To activate the keypad lock, choose in the settings the lock icon and turn the keypad log on. To deactivate the keypad lock, press ON/DIST key and within 2 sec the plus/minus key. How can I deactivate the keypad lock? To deactivate the keypad lock press the ON/DIST key and afterwards (within 2 Sec.) the plus/minus key. Now the keypad lock is deactivated and the device is switched on. Measuring with tripod – is there anything to consider? The measuring reference has to be adjusted to the tripod thread. In the Function Screen choose the reference icon and change the measuring reference to tripod. After switching off the device goes back to the standard setting (rear of device). What is measured with the height tracking? The height tracking displays an indirect height. The combination of inclination and distance measuring to the wall opens the possibility for such an indirect calculation. It is a useful function if the height cannot be measured directly or if several height points on the same vertical line need to be measured. What does ISO 16331-1 tested mean? When products and services meet our expectations, we tend to take this for granted and be unaware of the role of standards. However, when standards are absent, we soon notice. We care when products turn out to be of poor quality or are unreliable or dangerous. An ISO Standard ensures consistent quality and reliability for a product. The range and accuracy of laser distance meters depend greatly on lighting conditions and the reflective properties of the target object. For Leica Geosystems it is important that the performance of the device is maintained not only in the test laboratory but even more so on everyday site tasks. Therefore we have worked with external experts to develop a global standard to test and specify laser distance meters and allow comparisons between devices of different manufacturers. Instruments tested in accordance with ISO 16331-1 achieve their promises. Further information can be found on our website: www.disto.com. How can I program my favorite (mostly used functions) on the self programmable keys? Press the left or right top key for about 2 sec.. An overview (“Favorites”) with all functions appears on the display. Choose the preferred function and press then the left or right top key where you want to have the favorite behind. The favorite is now saved. What Bluetooth technology is integrated in the Leica DISTO™ D810 touch? The Leica DISTO™ D810 touch has Bluetooth® SMART (also called low energy) integrated. The device is working with Smartphones or tablets that have Bluetooth® 4.0 integrated or are Smart Ready. Also it is required that its operating system is supporting this Bluetooth® standard which is the case for iOS, Android 4.3 or newer, Windows 8. Can I send measurement data from a Leica DISTO™ D810 touch to Apple mobile devices? It is possible to use DISTO™ supporting apps from the app store (use App mode in DISTO™ device) or to connect the DISTO™ in the Bluetooth manager as a keyboard device where you can send the measurement data to the cursor position in any app (use text or spreadsheet mode in DISTO™ device). The corresponding modes in the DISTO™ device needs to be set in the Setting menu of the DISTO™. Can I send measurement data from a Leica DISTO™ D810 touch to Android devices? Yes with the Leica DISTO™ D810 touch it is now possible to communicate with Android devices. Its operating system must be 4.3 or higher. Send measurement data to Android devices that include Bluetooth 4.0. Used Apps should support the corresponding Bluetooth® standard (e.g. Leica DISTO™ sketch). § Can I send measurement data from a Leica DISTO™ D810 touch Windows computers? Yes with the Leica DISTO™ D810 touch it is possible to transfer data to Windows computers. The Leica DISTO™ D810 touch is “treated” as a keypboard. For this add the DISTO™ in the device manager as a keyboard device. You can then send the measurement data from the DISTO™ to the cursor position in any program (use text or spreadsheet mode in DISTO™ device). The Windows computer must have the operating system Windows 8 or higher and Bluetooth 4.0. Can I send measurement data from a Leica DISTO™ D810 touch to Windows mobile, Windows RT or Blackberrys? No this is not possible. My software only supports comma as a decimal marker and not a dot. Can I change this on the Leica DISTO™ D810 touch? Yes, this can be changed. In the settings menu for Bluetooth® press the right selection key to enter a submenu for Bluetooth setting. Here you can change the setting for this. Please note: This setting can only be changed in the text or spreadsheet mode. I need to fill out a form in the Internet or a spreadsheet and it is required to jump to the next input box with a Tab or with Enter after each measurement. Can I change this on the Leica DISTO™ D810 touch? It need to use navigation keys to move in my spreadsheet to the required input box. Can I do this remotely from my DISTO™ D810 touch? Yes, this is possible. When you have connected your DISTO™ device with a smartphone or tablet or computer the content of the selection keys change for supporting the Bluetooth communication. With the left selection key you can switch on and off the navigation function where you can use the arrow keys of the DISTO™ for navigation. Please note: This function is available in the text or spreadsheet mode. In the app mode it depends on the support of the app used. What is the difference between text or spreadsheet mode? In the text mode the measurement result will be transferred as shown in the DISTO™ display. This includes units or fractions for feet and inch. In the spreadsheet mode only numbers are transferes without any unit information. Units with fractions will be converted to the corresponsing unit with decimal. This makes further calculations like e.g. in Excel much easier. How long does it take to charge the Li-Ion battery of the Leica DISTO™ D810 touch? This depends from the used charger. With the charger out of the scope of delivery it takes approx.. 4hours to charge the Li-ion battery..
Is it possible to replace the Li-Ion battery of the Leica DISTO™ D810 touch? The Li-ion battery can be replaced in service cases only. Please contact your dealer for a replacement set of the Li-ion battery. Does Leica DISTO™ offer Apps ? Yes. Leica Geosystems offers an App DISTO™ sketch. This App is available for iOS on iTunes and for Android on Google play. The angle in a triangle can be determined< br>by measuring the three sides. World’s first: The Leica DISTO™ D810 touch is the first laser distance meter with a touch screen, allowing for quick and intuitive operation. Another revolutionary feature allows for measurements with pictures. The integrated camera allows the user to capture images and download them to a computer via a usb interface. And with Bluetooth Smart data transfer, you can send the measured dimensions directly to the cursor position on Apple, Android, AND Windows devices. It has never been easier to determine the width, height, area or even the diameter of an object. Take one measurement at a right angle to the object. The measured value appears in the display. Then move the two arrows on the touchscreen to determine the dimension between them. The camera function on the Leica DISTO™ D810 touch can be used to create pictures or screen shots, which can then be downloaded to a computer via USB interface. In keypad mode using Bluetooth® smart, you can link your Leica DISTO™ D810 touch to your Windows computer or iOS device and send measured values in the form of a keyboard entry to any program. A touch screen - Simple! The Leica DISTO™ D810 touch is equipped with a large touch screen for quick and intuitive operation. Common gestures used on smartphones, such as swipe, and zoom with two fingers can be used, making all functions simple and easily accessible. Measurements can also be taken using the touch screen. This avoids unintentionally moving the device during the measurements. With the integrated digital Pointfinder, the Leica DISTO™ D810 touch easily and accurately takes measurements in unfavorable light conditions. The overview camera provides excellent overview or the measurement target, in a second step the target can be zoomed in four stages with the 1x, 2x and 4x zoom. Even when laser point is not visible to the naked eye, the target can be seen on the large, high resolution display of the Leica DISTO™ D810 touch. The range and accuracy of laser distance meters vary based on lighting conditions and the reflectivity of the measuring target. Leica Geosystems designs instruments to perform not only under perfect laboratory conditions, but also under the kind of working conditions our customers see every day. This is why, working together with other experts in the field, Leica has worked to develop ISO16331-1, a standard by which laser distance meters can be tested and compared to each other. The Disto E7500i has been tested in accordance with this standard.